Violence is to be found in "a police force which commits multiple acts of brutality against peaceful demonstrators", it is embodied in "your lying and scornful words", the artists say. Could someone please translate their full letter (text plus 2600 signatures is [url=http://www.ledevoir.com/documents/pdf/lettre_ministre_finale_signatures....)? Thanks! "As the Quebec students are showing the rest of North America, it is necessary to 'seize the time' and to expand the immediate struggles against rising education and burdensome debt loads to attacking the economic foundation which gives rise to mass exploitation and oppression - to ideologically and politically attack the capitalist system and to mobilize for socialist revolution. We plan to raise hell and raise it well.."
Here are links to BC's premier internet news site's take on the student strike and a report on the 1%. Much of the media coverage of the Quebec student protests has dismissed the protestors as cranky middle- and upper-middle class children trying to protect their unfair privilege. And in fact, the vast majority of today's university students do come from relatively well-off families. But rather than weakening their position, this supports the protestors' claims that we have a serious problem with access to education -- a problem that would only be exacerbated by tuition hikes. Instead of recognizing this, most media commentary perpetuates a discourse of austerity, demanding that students share the pain that other public service users are suffering. Here are seven reasons why we would all be better off if we increased public investment in higher education and reduced the burden that high tuition fees impose on students and their families. Fifty-eight percent of individuals at the top have at least a bachelors' degree, a greater proportion than the broader population, where 19 per cent of the adult population are university graduates. Top earners hail from a variety of sectors. Just 10 per cent of people in the top one per cent work in the finance and insurance industry (despite garnering most of the public's wrath). Senior managers and CEOs are over-represented in the top group, but still only account for 14 per cent of top earners. The only other large group of top income earners? Physicians, dentists and veterinarians who comprise almost 10 per cent of top earners, despite representing less than one per cent of the workforce. 51st consecutive nocturnal demonstration is proceeding right now in Montréal. ETA: Casseroles Canada put up a photo on their Facebook page claiming it's a photo of a rally in Mexico in solidarity with the Quebec students, but several posters say it's actually a photo of a rally in Venezuela of Chavez's opposition candidate. Gotta check these things carefully. "Canada's social democratic party, the NDP, has proclaimed itself 'neutral' in the struggle between Quebec's students and the provincial Liberal government and has remained mum on Bill 78 - draconian legislation that criminalizes the four month old student strike and places sweeping restrictions on the right to demonstrate anywhere in Quebec over any issue...This is preposterous." "A Quebec student leader ahs apologized to B'nai Brith Canada for Nazi salutes performed by protesters and promised to advise students to refrain from behaviour evocative of the Nazi regime.."
Last night, at the Francofolies festival, the four reps of the student associations took the stage with Loco Locass (a very popular group of 3 rappers) for a rendition of Libérez-nous des Libéraux! (Liberate us from the Liberals!). This video has the whole thing in decent sound.The Libérez-nous des libéraux song gets started at around 5:00. This show was attended by a huge crowd (apparently the largest crowd in Francofolies history). ETA: that is, the intro starts around 5:00 and the actual song around 10:00 (they wove in Nirvana's Smells Like Teen Spirit into the song). Woman arrested in Montreal for reading George Orwell's "1984"
The Liberal Party will launch an advertising campaign consisting of Charest speaking to the people about his record. Rumours have begun of an election call August 13, with Quebecers going to the polls September 17. Meanwhile, CLASSE will hold town-hall meetings throughout Québec to discuss the idea of a "social strike", involving workers, students, and community groups. "The UN High Commissioner for Human Rights is set to criticize Canada for the controversial law passed by the province of Quebec to clamp down on student tuition protests. 'Moves to restrict freedom of assembly continue to alarm me, as is the case in the province of Quebec in Canada in the context of students'protests,' the commissioner is to say..."
Here's the actual statement from Navi Pillay, High Commissioner for Human Rights to the Human Rights Council (rather than the report by UN Watch, which seems to me to be what would be called on the Interwebs a "concern troll" organization...). Today's incident in Québec City shows again how low the state officials have sunk. City Council adopted an anti-demonstration bylaw similar to Montréal's, banning any assembly whose details and itinerary haven't been provided in advance to the police, and banning participation in any assembly at all between 23:00 and 05:00. About 40 opponents of the bylaw were present in the council chambers during the vote, and demonstrated afterwards. During a verbal confrontation, Mayor Lebeaume's chief of cabinet, Louis Côté, freaked out and started shoving some demonstrators. One of them followed the mayor and his entourage, declaring that he wanted to file a complaint against Côté. Côté then ordered two cops to arrest the demonstrator, for assault. The demonstrators then proceeded outside to march, and 21 of them were arrested. 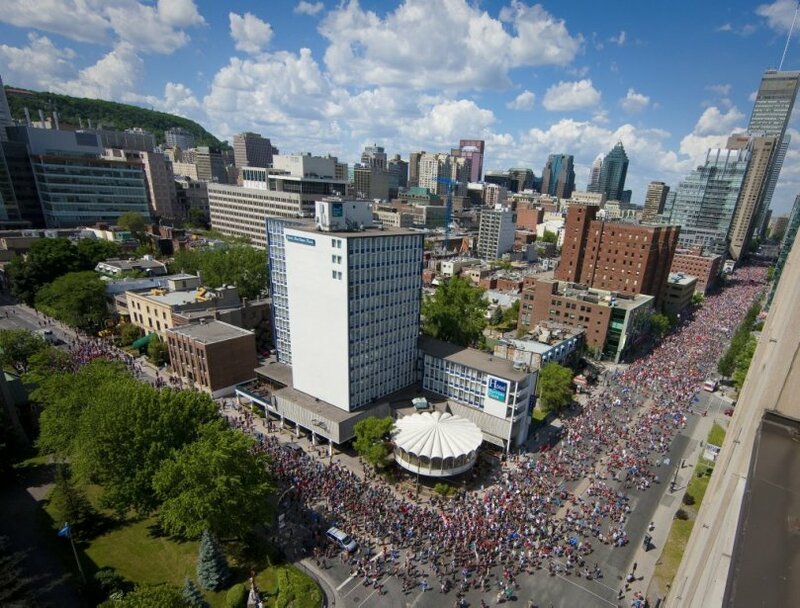 Lebeaume needs his fascist bylaw in place for the big demo of June 22 and the Fête Nationale events of June 24. I'm interested in any commentary or remarks by the Education students in Quebec regarding the actions and strike. Anything. That ADEESE adopts the principle of civil disobedience and considers that when injustice is the law, resistance is a duty. That ADEESE asks FEUQ about the possibility of pursuing John James Charest before the International Criminal Court and that if it's possible, then steps be taken in that direction. That ADEESE demands the government withdraw Bill 78 and that the government condemn police brutality. That ADEESE commite to offer unconditional support by all means necessary to its employees and elected representatives targeted by Bill 78 so long as the actions of the executive and the board of directors respect the mandate of the general assembly. That ADEESE, in a militant perspective, offer a training workshop in demonstration safety. She says it reflects no change in her support for the students' cause, but with an election call thought to be weeks away, there are broader issues to raise. She says this isn't a "whipped" decision - PQ MNAs may continue to wear the red square if they wish. Isn't that nice of her? Why can't she wear both? The Québec Human Rights Commission is investigating two complaints of discrimination against persons wearing the red square - one who was refused entry into a bar in the Québec City region, another was denied access to an enterprise selling mechanical parts. There are also reports of landlords refusing to rent to people wearing the red square. If the album cover in the OP is the one in question then the furor over violence in politics is absurd. Raiding a politicians home with cameras rolling is police state censorship and vilification of dissenters. This was one of my favourite paintings when I went to the Louvre. Who knew it was too violent to be shown in public without causing offense. Tonight's the night for a major protest right across the country. "For the second time in a week, a United Nations official has listed Canada alongside illiberal regimes as a prominent violator of basic rights and freedoms. Speaking on Wednesday before the UN's human rights council, UN special rapporteur Maina Kiai listed Canada - along with Belarus, Ethiopia, the Russian Federation and Jordan - as countries where 'the laws are particularly harsh in terms of restricting the freedom of association.' Mr Kai was specifically referring to Quebec's recently passed Bill 78. The comments came just two days after Navy Pillay, the UN High Commissioner for Human Rights, addressing the same council, called the Quebec bill an 'alarming' move to restrict freedom of assembly..."
Yet despite these abuses having now become a matter of international concern and censure, the NDP and Thomas Mulcair continue, by their official silence, to aid and abet his former cabinet colleague the Premier of Quebec. Having a few Quebec MPs show their faces occasionally at marches is an empty feint at blunting criticism. But their political opportunism and disgraceful 'neutrality' on behalf of Jean Charest has surely become obvious to all. Once again the ndp pretends to run with the hare but hunts with the hounds. Why is their shameful silence on this ongoing and outrageous national and international disgrace permitted to continue? That's how I feel, even though I voted for the guy. uh, maybe because it would be electorally suicidal and politically ineffective. But the people have been marching in the streets, pepper sprayed, beaten and arrested for well over 100 days - banging their pots and pans in harmony with a whole world similarly viciously attacked by ruling class fascists - and Quebecers are told not to expect their elected representatives to endanger ndp political chances? Always the same excuses for cynical politrix and tactical cowardice. Let the strong, brave hearts of the people march on to victory. And never forget who stood and who stayed. Have to agree with NDPP on this one. The following are two items on the response of the Canadian labour movement to the student strike in Quebec. The first is an article on Ken Georgetti's brazen sellout of Quebec students, and by extension the Canadian working class. The second is a letter from CUPW to all its locals calling for urgent solidarity and legal defense for Quebec students. Recent correspondence from Ken Georgetti (President of the Canada Labour Congress) and Michel Arsenault of the FTQ (Provincial Labour Central of Quebec) and various officers in the broader Anglophone Labour Movement sends a clear message: labour jurisdiction trumps labour solidarity. Arsenault, and through his endorsement, Georgetti believe that this is the time to "facilitate a settlement instead of fueling fires". Aresenault wrote to Georgetti on May 28th, saying that the "radical wings" are not to be "promoted" in order to facilitate an agreement. It seem that to him, an agreement in itself is more important than a victory for the students and workers of Quebec. The message is clear, class peace at all costs. He says the students are tired and have been fighting a long time as a reason why they should not be supported. This is pathetic. In response, Georgetti wrote to the CLC Canadian Council on May 28th, responding to "rumours" that some of the CLC "national affiliates plan to organize potential illegal actions in Quebec" in solidarity with the student strike. Georgetti points out that "matters in the province of Quebec are the jurisdiction of the FTQ" and so "it will be the decision of the FTQ to request external support actions of affiliates through the CLC." Until then, CLC affiliates are supposed to avoid support actions. He closes his letter saying "I know that all affiliates and federations respect the jurisdiction of the FTQ in their province and hope that such rumours are simply rumours and not fact." See the original letter here. 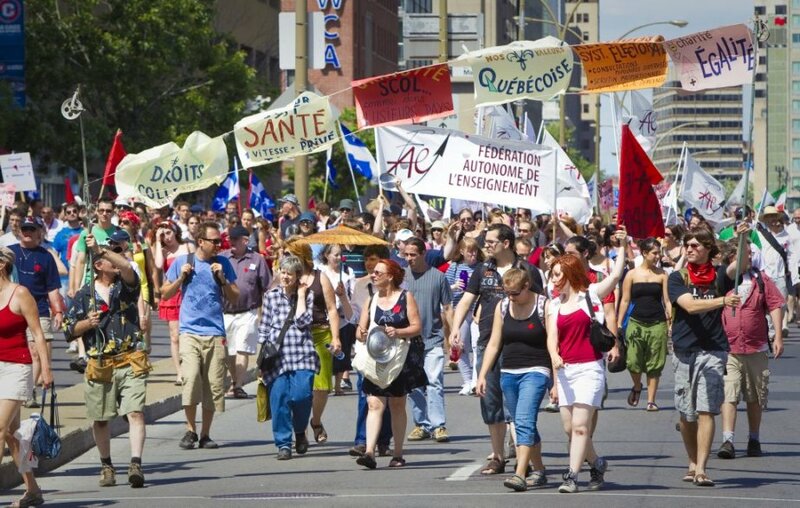 A spectacular movement is underway in Quebec against rising tuition fees. Hundreds of thousands have marched in the streets in support of the students. Thousands have been arrested. Jean Charest has brought in draconian legislation to try to crush the movement. Bill 78 removes the right of peaceful assembly and imposes massive fines on student unions and individuals who participate in "illegal" demonstrations. Despite intensifying police violence and legislative attacks, what began as a fight over student debt has grown to into a popular struggle for equality, social justice and basic democratic rights, including the right to public assembly and dissent. If Quebec students have lit the fire, what the government and ruling class fear the most is that the flames will spread across Canada. What's happening in the cities and towns of Quebec is happening in our own communities and workplaces. While corporations and the rich get increased tax breaks and government handouts, poor people, workers, and students are asked to foot the bill. It's one struggle. And the uprising in Quebec has reminded us that if we organize and fight back, we can win. As the movement grows, so do the legal bills. There is an urgent need for legal defense money. We urge locals to contribute to CLASSE's legal committee to help cover these costs. From: Casseroles Canada. ‎22 juin, Montréal. June 22. Crédit photo : André Pichette. NDPP and Left Turn: Big talk. People can read the original materials themselves, without the brave descriptions of "sellout", and come to their own conclusions. You want Ken Georgetti to march in here at the head of militant Canadian workers? He will be sent packing - with thanks for his thoughts. The following are two items on the response of the Canadian labour movement to the student strike in Quebec. The first is an article on Ken Georgetti's brazen sellout of Quebec students, and by extension the Canadian working class. "Nobody who has observed Georgetti's career as labour fakir and lieutenant of the bourgeoisie, the agent of imperialism in the working class movement, will be a bit surprised at this latest sellout. The facts are that Georgetti has made a career out of selling out struggles. Ask the teachers, public servants and woodworkers of BC, of the great solidarity shown by Georgetti as he sold them down the river one by one.."
and this link to a further caveat emptor the Quebec student movement should keep in mind..
'why do labour bureaucracies, despite historical as well as recent evidence of labour, social democratic and even socialist parties pursuing neoliberal policies of globalization and austerity - forcing working people to pay for the crisis caused by the banksters - wed themselves to electoral parties that repeatedly betray the interests of their members and of working people in general? How do labour bureaucracies, justify 'turning a blind eye' to the injustice of aggressive wars being fought overseas, with our money and our blood, as well as the steady implementation of domestic laws that violate our basic rights to freedom of speech, association and due process..?" I agree with U - you DON'T want Ken Georgetti to march in...No way. Not at all.. Meanwhile, in real life, far from the ruminations of U.S. revolutionaries heroically plotting to take over the world from the front lines of their keyboards - tens of thousands demonstrated today in Montréal and Québec City - students, workers, anti-poverty organizations, women - in support of the students' cause. Your photo is bigger U, but I got mine here first (see post #37). Aaaack - you're right, Boom Boom! I think the students in Quebec should be targeting the feds a little more with their demands if they aren't already doing so. As corrupt and unpopular as the Charest Liberals are, they are only following orders from Ottawa and abiding by international plans to commodify post-secondary education ie. the Balogna process. The plan is to create a "right-to-study "state in the style and manner of southern right-to-work states in the U.S. Neoliberal ideology was not born in Quebec and certainly not forced on them, either. Quebec universities want more foreign students paying approximately seven times the tuition fee amounts that Quebec students are paying now. GATS and the Balogna process have no real time table to be implemented, but the Charest government seems to be in an advanced stage of neoliberalizing post-secondary compared to dozens of other nations. The cult of impotence in Ottawa deserves at least equal blame. As corrupt and unpopular as the Charest Liberals are, they are only following orders from Ottawa and abiding by international plans to commodify post-secondary education ie. the Balogna process. Charest takes his orders from Harper. You should know better Fidel. They both take their orders from the same type of people. The people who run SNC-Lavalin probably have the ear of both of them as do the Power Corp people. The people with power talk directly to both of them. Harper is the puppet not the puppet master. The real puppeteers allow him to play the role of puppet master in the realm of politics but they can yank his strings and get him dancing any tine they want. The same is true of Charest. He is just another puppet but Harper is not his puppet master. When do we get the Law 78 injunction ruling?